When your toenails grow into the tender skin on the edge of your toe, the result can be a painful cut that can lead to infection and even possible amputation in patients who also have diabetes. Obvious symptoms of an ingrown toenail will include swelling, pain, tenderness, and redness around the edges of the nail and extreme pain when you push on the nail or try to wear shoes. Probably the main instigator of a toenail growing into your skin is poor nail cutting technique. Cutting your toenails nails straight across rather than on a curve is essential and try not to cut them too short. Some individuals may inherit a tendency to have excessively curved nails which can make prevention and treatment more difficult, but everyone can benefit from the following preventative measures. Cutting your nails too short and on a curve rather than straight across is the major cause of ingrown toenails, so always be careful when cutting your nails or better yet, have your foot doctor properly trim them. Avoid shoes that crowd your toes. Tight fitting shoes like pumps are particularly bad for your toes since they force extra weight behind them, increasing pressure on the edges of the toenails. Wearing shoes with a wide toe box will give your toes room to move. Another major cause of ingrown toenails is from injury, such as from dropping a heavy object on your foot. Wear protective footwear like steel toed shoes if your work or activities may risk a serious toe injury. 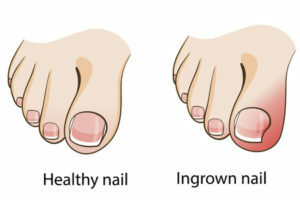 If you are having trouble with an ingrown toenail, see your podiatrist for the correct care. At Family Foot & Ankle Clinic, Dr. Stephen Markantone treats a wide variety of foot and ankle conditions including sports injuries, diabetic foot issues, pediatric foot conditions, toe and foot deformities, fungal infections, and heel problems. Equipped with the most advanced technologies and a dedicated staff, Family Foot & Ankle Clinic provides individualized and high- quality care for patients in the North Versailles and Delmont, PA areas. Contact our North Versailles office at 412-824-9370 or our Delmont office at 724-733-3338 to schedule an appointment.